Australian paint maker DuluxGroup is on track to be taken over for $3.8 billion by Japan-based Nippon Paint Holdings. The DuluxGroup board has unanimously recommended to shareholders that they accept the offer — $9.80 per share (in cash) which includes a fully franked interim dividend of 15 cents per share. It also said shareholders may potentially receive a special dividend of 26 cents per share, fully franked, as part of the deal. 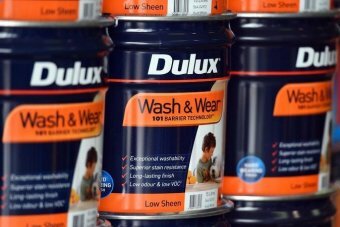 The Japanese company is prepared to pay a 27.8 per cent premium for the Australian company, as DuluxGroup’s shares last traded at $7.87 on Tuesday. DuluxGroup had thought about continuing its domestic and global growth as a standalone company, its chairman Graeme Liebelt said. The board ultimately decided that being acquired by Nippon was in the best interests of shareholders, particularly given the “significant premium to market value”, he said. Nippon Paint operates in Asia, Europe and the United States, but essentially has no presence in Australia or New Zealand. “The proposed acquisition is an important step in Nippon’s global growth ambitions,” DuluxGroup said in a statement to the ASX. Shareholders of DuluxGroup are expected to vote on the potential takeover at a meeting to be held in late-July. The takeover is subject to approval by shareholders, the courts, Foreign Investment Review Board and New Zealand Overseas Investment Office.